Part of the fun of being on vacation is trying all the local foods. Alex and I try really hard to avoid chain restaurants when we’re eating in Omaha, so you can bet we will avoid all chain restaurants when we’re traveling. I don’t think of it as being a “foodie” or being snobbish, I think of it more as being practical. It is a safe bet to say that Applebee’s or Olive Garden orÂ insertÂ chain restaurant here, is going to taste the same at home as it will in any other city you visit. The lessÂ adventurousÂ eaters here might find that comforting. Each to their own. When we were in Miami in May we went on a Culinary Tour –I highly recommend it. While we were trying all the delicious goodies our travel guide Mirka would fill us in on the food we were eating. Lots of times she would tell us what was in the food. At one of the stops we ate the most delicious Argentinian empanadas. 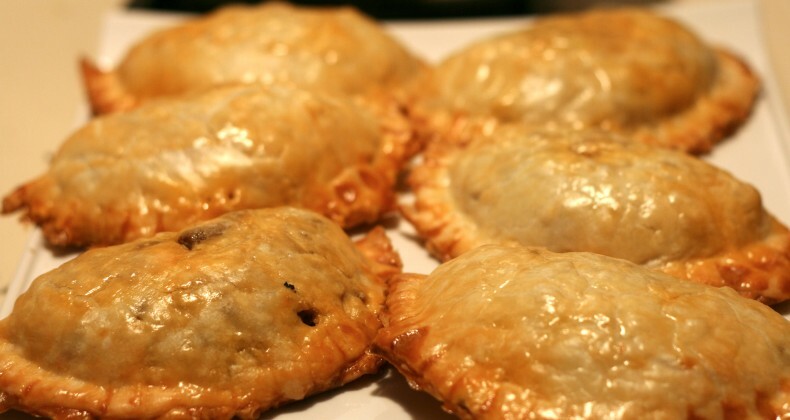 Mirka, being ofÂ ArgentinianÂ ancestry, was able to tell us all of the tasty ingredients in the empanadas. I wasÂ trying to take notes as quickly as she wasÂ rattlingÂ them off. These notes are what I used for my vacation inspired dinner. You could make these smaller and serve them as an appetizer, or make them slightly larger and serve them as a main dish. Since this was a last minute vacation inspired dinner I ran out a bought some premadeÂ PillsburyÂ pie dough to use. I have to say that I am not a fan of green olives what-so-ever, but these would not be the same without them. In fact, I could have added more and still would have thought they were delicious. As you can see in my ingredient list, I forgot the red bell pepper. Add it to be traditional, but if you omit it I won’t tell anyone. My other vacation inspired dinner:Â Naan, Shish Tawook, and Muhammara-YUM! Over medium heat brown hamburger and onions. Season with salt, pepper, cumin, and paprika. Once hamburger is browned (about 10 minutes) set aside to cool slightly. Once it has slightly cooled mix in hard boiled eggs, green olives, green onions, and cheese. Roll out the pie dough into a circle slightly larger than the hand pie crimper. 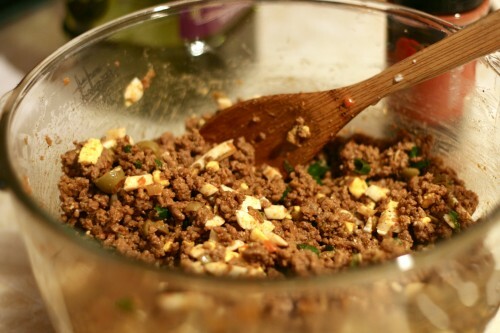 Scoop a couple spoonfuls of the ground beef mixture into the center. 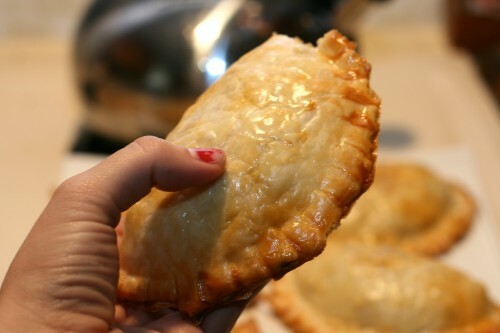 Close the hand pie crimper around the filling. If you don't have one of these handy dandy tools, you can cut out a 5-6 inch circle of pie dough. Fill half of it with the ground beef mixture, pull the other half of the dough over the mixture, and crimp close with a fork. Place your empanadas on a baking sheet and brush on an egg wash (1 egg scrambled with a splash of milk). Bake for 15-20 minutes, until golden brown. Remove and cool briefly before serving.